Unsure of its full potential initially, professional photographers are quickly realizing that an iPad is a critical piece of equipment. For many, an iPad has become a “digital assistant,” with the capability to view images on a high-resolution screen anytime, anyplace. It’s also a portable portfolio that can be easily presented to clients during meetings, over lunch or during informal chats. Many photographers like how an iPad serves as a backup device to their camera and/or computer. The increasing number of highly useful apps has also elevated the stature of an iPad as a device pro photographers need on every shoot. For example, Easy Release provides model release and property release forms in a digital format. The free Impression app adds a watermark to photos. The most significant, and serious, app to be released for the iPad just may be Adobe Photoshop Touch. Introduced during late February 2012, this app for the iPad 2 gives any pro more convenience and control. Not only can he or she perform basic editing of photos right from the camera during a shoot, but also share those images displayed in working layouts of ads, features, etc., with clients, editors and art directors via a wireless connection. Some pros have discovered that their initial response to the iPad as simple a platform for fun and games is actually a beneficial feature when using Photoshop Touch. The casual nature of interfacing with an iPad, compared to an editing system anchored to a worktable and space, has unexpectedly resulted in photographers and designers feeling freer to create better work. It won’t take much time for any photographer to learn how to combine multiple photos into single images, complete critical edits and utilize various effects to enhance their from-the-camera files. 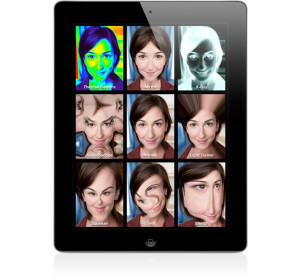 Adobe Photoshop Touch for the iPad 2 also has touch-up, paint and layout features. When objects must be removed from an image, a quick scribble with the Scribble Selection Tool will mark them for elimination. A major challenge for many photographers during the editing process is selecting areas of a photo with soft edges. Photoshop Touch’s Refine Edge functionality makes this process much easier and faster, so photographers can complete more editing during less time. Other popular Photoshop editing techniques with Touch on an iPad 2 include sky replacement, paint effect, camera fill and blend modes. Photoshop Touch was brought to the Android tablet market during 2011, and is just the first of six touch-screen apps that Adobe will be introducing to iPad users during 2012. The others are Adobe Collage for moodboards; Adobe Debut for presenting and reviewing creative work; Adobe Ideas for sketching; Adobe Kuler® for exploring color themes; and Adobe Proto for Web site and mobile app prototyping. You can also visit Adobe TV online for video tutorials about using Photoshop Touch on the iPad 2 at http://tv.adobe.com/show/adobe-evangelists-russell-brown/. Adobe Photoshop Touch for the iPad 2 can be downloaded from the iTunes App Store for just $9.99.